Preheat large electric skillet to 350 degrees. Add scallops, wine, lemon, and lime. Bring to a boil. Reduce heat to low. Add remaining ingredients. Cover and simmer 4-5 minutes until scallops are tender. Remove bay leaf. 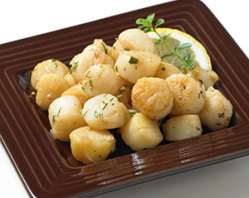 Remove scallops with a slotted spoon. Drizzle sauce over scallops and serve.